I'm going to classify these shoes under stylish and comfort opposed to performance and durability. And so comfortable they are. When you put these on for the first time, you will be amazed. The shoe feels like it has already been broken in for a month. The style is my favorite thing about the shoe. The mesh part of the shoe is the colored background for the Callaway logo on the side. The shoe is hip and modern looking. If it were me, I'd buy all three colors (Coral, Lilac, and Citron) to match my extensive golf wardrobe. The cons of the shoe are performance and protection. The shoe isn't the most stable shoe I've ever seen. There are no spikes on the bottom; instead, Callaway uses little rubber nubs. They advertise the shoe as waterproof, but I'm going to respectfully argue that one. 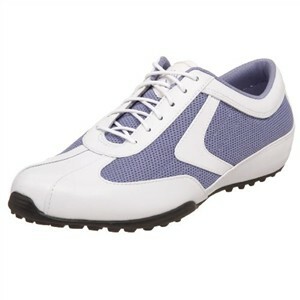 I've yet to play in a golf shoe that uses any type of mesh outer that kept my foot completely dry in wet conditions. However, keep in mind I play most of my golf in the great Northwest where we battle sloppy, muddy conditions 8 months out of the year. For a high performance shoe that is waterproof, take a look at these: the Callaway Women's Hyperbolic Golf Shoe and the Adidas Tour 360 3.0 Womens Golf Shoe.